The Jakarta Biennale is a biennial event of Indonesian contemporary arts. Jakarta Biennale (JB) is contemporary art exhibition held biannually in Jakarta, the capital city of Indonesia. JB presents various cultural activities to be enjoyed by Jakarta’s citizens as a way to perceive the “city”, an area that is moving and constantly changing. Jakarta, as one of the biggest cities in South East Asia, is strongly dynamic and becomes social, political, economical and cultural mirror of contemporary Indonesia. At the beginning, JB was held in 1968 under the name of Grand Exhibition of Indonesian Painting (Pameran Besar Seni Lukis Indonesia) at Jakarta Arts Center, Taman Ismail Marzuki. Along with major development and change in visual art realm as well as in society, the exhibition evolves by engaging more cultural activities all together with wider public. JB opens creative potentials in order to revitalize public spaces in the city through collaborative works between artists, creative workers and local citizens. The name was changed to the Jakarta Biennale (painting) in 1975, then Biennale Fine Arts in 1993. Painting was again a dominant presence in Biennale X in 1996 and Biennale XI in 1998. The organizers came up with additional programs to re-exhibit the works of Indonesian maestros. Biennale went into a lengthy hiatus following the socio-political turmoil and the shift in governmental power in post-1998 Indonesia. During this period, the Indonesian art scene lost a measuring standard that have been going on for three decades. However, the period also prompted DKJ to review the Biennale in order to be better equipped to face the bigger and more complex challenges of the future. The biennale returned eight years later, headlined as 2006 Jakarta Biennale. In 2015 the Jakarta Biennale event is organized for the first time by Jakarta Biennale Foundation, after previously being held by the Jakarta Arts Council (JAC). Jakarta Biennale Foundation was established on October 2014. Jakarta Biennale 2015 is curated by Charles Esche together with 6 Indonesian young emerging curators. Jakarta Biennale 2015: Curatorial Concept and Artists. Jakarta Biennale is a continuous reading on the development of the idea of the city. Jakarta Biennale 2015 Announces Project Proposal. 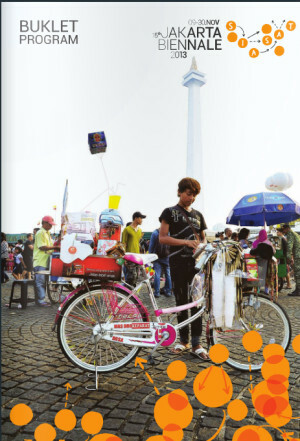 15th Jakarta Biennale Program available online on ISSUU. 15th Jakarta Biennale: Booklet online. “SIASAT” invites both individual and collective artists practicing collaboration, participation, community-based project, intervention in public spaces, and thematic responds on specific subjects, and spaces. 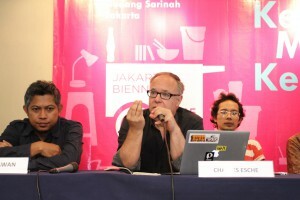 15th Jakarta Biennale 2013: Theme and Artists Announced. The 14th edition of Jakarta Biennale is entitled “Jakarta Maximum City: Survive or Escape”.